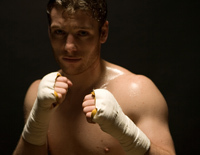 "Ireland's" John Duddy is one of the fastest rising stars in pro boxing. 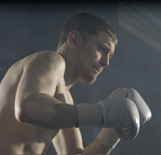 The combination of his exciting, classic Irish blood-and-guts style of fighting and matinee idol looks have helped the unbeaten Irish Middleweight sensation capture the hearts and minds of boxing fans in his native Ireland and throughout the United States. won his first National title at 15 as a light middleweight in the Junior Division, later adding the Irish title as an Intermediate and Senior. On the advice of his amateur coaches in Ireland, he turned pro in 2003 and relocated to New York City to immerse himself in the professional world of boxing at Gleason’s Gym and Irish Ropes. For the past three years, John has fought his way to the very top! His pro debut was September 9, 2003 in the Bronx against Tarek Rached, who John knocked out in the first round. And he has won every single professional match since! In March 2004, Duddy stopped previously unbeaten Leonord Pierre at 1:23 of the opening round on ESPN2. He became an instant ESPN favorite. Duddy followed with an 8th round decision against Patrick Thompson in historic Madison Square Garden and has since fought there regularly, most recently in March 2006 where he knocked out his opponent in the first round and was declared Middleweight Champion and June 2006 where his challenger could not come out of the corner after the 7th round and John successfully kept his title. He has a (17-0) record with 15 Knock Outs. John currently lives in Queens, New York and is promoted by Irish Ropes, managed by the McLaughlin Brothers and trained by Harry Keitt. One of Ireland's most decorated amateur boxers of all-time, junior middleweight James Moore has followed the same path as former World Champions Stevie Collins and Wayne McCullough, as well as his friend John Duddy, across the Atlantic Ocean from Ireland to the United States to further develop his skills and market himself as a professional. Moore started boxing at the age of 6 and a year later started his amateur career. All told he had nearly 300 amateur matches and is Ireland's all-time leader in terms of medals won at International competitions. He was the 2002 Irish Amateur Boxer of the Year as well as Captain of the Irish National Boxing Team. The son of Irish Team boxing coach, Jim Moore, James was a three-time Irish Senior Championships winner, in addition to capturing the 2002 Four Nations Tournament in Liverpool. In 2001, Moore became only the fifth Irishman to capture a Bronze Medal at the 2001 World Championships held in Ireland, reaching the semi-finals of the welterweight division, his fifth fight in six days. In his August 8, 2005 pro debut, Moore stopped Gabrial Garcia in the second round of their match in New York City. Three weeks later, James won a four-round decision against former New York Golden Gloves champion Cory Jones. James faced adversity for the first time as a pro September 17, 2005 when he was decked in round two by veteran Holister Elliott in Mansfield (MA). Moore, however, quickly responded with a devastating knockout at 1:06 of the third round. James now lives in Queens, New York and is promoted by Irish Ropes, managed by the McLaughlin Brothers, and trained by Harry Keitt.